The only guide from the ACT organization, the makers of the exam, revised and updated for 2019 with 4 genuine, full-length practice tests and 400 additional questions online. 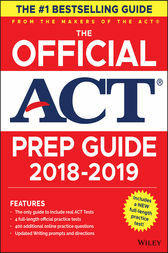 The Official ACT Prep Guide, 2018-2019,is the only guide from the makers of the exam and includes actual ACT test forms (taken from past ACT exams). It offers 4 actual ACT tests (all with optional writing test) so you may practice at your own pace. To help you review, this guide provides detailed explanations for every answer and practical tips on how to boost your score on the English, math, reading, science, and optional writing tests. The test creators also created online resources accessible through this book. You can practice with the 400 additional test questions that can be organized, filtered, and tracked for performance. Or you can read the online articles discussing everything from a polished college admissions form to tips on how to graduate in four years. The Official ACT Prep Guide, 2018-2019 is the best resource to prepare you for test day. By using this guide you can feel comfortable that you are preparing to do your best! ACT (Iowa City, IA) is a not-for-profit organization providing assessment, research, information, and program management services to support education and workforce development. Known most widely as the makers of the ACT exam--the college readiness and placement assessment taken by some 1.8 million high school students each year--ACT produces a number of assessments and services reaching more than 10 million people along the kindergarten through career continuum. ACT's rigorous research informs policy decisions and helps develop programs that boost lifelong learning potential in schools and workplaces around the world. To learn more, visit www.act.org.